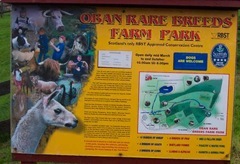 well we didn't actually spend the day in Oban, but what we did do was visit a couple of attractions just outside of Oban. We have been here a few times over the years, and generally have enjoyed it, even though from Dunoon, the drive is just under 2 hours. In my view this is not as good as it used to be, they used to allow the public to feed the sharks in the shark pool, but no longer, the otter pool is not up to much and the seal pool looked like it needed some tlc, certainly not worth the entrance fee this year, at it's best the centre was only a half day attraction, but now a couple of hours is plenty. This place is pretty good, you could easily drive past it, it is located just before the Connell bridge and is about 3 miles down a single track. when you get there be prepared for a good walk up hill, the park keeps rare breeds of sheep, pigs or anything that they consider to be rare. at the top of the park, the have an open enclosure where the animals are tame enough to approach the kids looking for food. we managed to get right next to some red deer and some alpacas. the site would keep you occupied for a good half day, and the kids will drag out their time in the animal handling area in their top barn where they can handle rabbits and guinea pigs.